"One of the teachers had the idea to create a Tracking Wall. We ran off two shoe designs on card stock and had all of the kids color their own shoes. We laminated them and cut them out. The track is all colored masking tape. When a child reaches a designated mileage goal, we move their shoe into that 'miles run' area on wall. When a student reaches 100 miles, they get a special sneaker sticker on their shoe. I write 100, 200, etc. on the stickers. Then the shoe starts the track all over again. Two of my girls spend a recess or two each week moving all the shoes. I give them a Just Deed for that." "We havae done some ladder runs where each group runs in a line and they take turns going from the back to the front of the group to set the pace. Every other week they like to JUST RUN the course to see how fast they can go. With the younger kids we do some red light, green light, orange light drills so they can learn pace a bit better. They tend to know their own limitations and slow down and speed up as they feel. We have found that when we tell them not to stop until they reach a cone marker, that helps their endurance as they often go a bit further when they feel like stopping. The coordinator at our school created a JUST RUN bulletin board, located in a prominent location in the main hallway. A map of the United States shows how far we have run on our trip to the east coast. Pictures of some of our runners and words of encouragement are also on the board. Course: The moms measured and layed out a half-mile course around La Mesa's school yard and put out cones to mark every 10th of a mile. Separating into Groups: There are children from kindergarten up through 6th grade and at the first session, based on ability, there were 4 running groups formed. They are mostly based on age but there are some younger kids that run with and keep up with faster groups. Stretching and warm up: Each session is started with a group stretching session for warm-up. A child is selected to begin each session with his or her favorite warm-up. Another teacher printed off JUST RUN mileage markers from the website for 25, 50, 75, and 100 miles and attached them to colorful paper. These were posted on her classroom door along with the lists of children who achieved these mileage goals. This was a great motivator and gave recognition to all of the children who reached these mileage accomplishments." "To get the teachers involved, I went into some rooms and fixed them a JUST RUN bulletin board. I took the students out myself and did laps on the track. The activity they really like is Switcharoo. Runners find a partner, get back to back, and go in opposite directions with one walking and the other jogging. When they meet, they high-5 and switch walking and jogging. It gets them all moving because they have a partner depending on them. The JUST RUN bulletin boards in the hallway at school look good and are great motivators for all." "As each child finished a designated number of laps, increasing each session from 2 to 3 to 4 to 5, etc., each would go to one of several exercise station areas. There were exercise stations designated for jumping jacks, push ups, and sit ups. After the exercises a warm-down lap or two was run. The children also enjoyed competition like 100 meter sprints against each other, with the winners advancing from each group to race against each other. They also liked to run one lap to beat a designated time, for example everyone tried to run faster than 2 minutes. One special workout most kids enjoyed was a backwards challenge. To mix up the running on the track, they were challenged to run backwards the entire time for one lap without stopping or to do some out of the ordinary thing besides running. One interesting idea is to get children who usually stand and talk to 'walk while they talk' at recesses or during lunch time. Especially if they wore pedometers, this walking while talking gives them quite a bit of unexpected exercise." We try to keep the kids moving the entire JUST RUN session time and don't let them idle too long. With that in mind, here are some activities they enjoy more than others. 1. For a warm-up we set out soccer balls about 30 feet away from the kids. We have them get into lines of about 4-5 behind one of the soccer balls; there are about 10 soccer balls. If the teams are bigger then they are idle too long between running. We make teams as small as possible. Each kid, in turn, then runs to the soccer ball and runs around the soccer ball twice to the right and comes back. They repeat this twice and then go to the left twice. 2. We have the kids line up in a horizontal line in any random order and again have the soccer balls about 30 feet away. We yell out a grade level and the kids all run to the beginning of the soccer balls, they then run over the top of each soccer ball as you go down the line of balls. The key here is organization and team work. The kids have to be able to form the line at the beginning of the balls and make it over each ball without hitting any of them. What makes this exciting for the kids is the competition; we time the kids and reward the winning grade with praise. They then brag about how they won to the rest of the kids. 3. The kids don’t really seem to enjoy running a straight mile. However, when we break up the mile and make it into long relays they seemed to enjoy it a lot better. Have a group of four kids and line them up at each corner of the track or designated parts of the field on which you run. One of the kids starts with a baton in their hands and runs straight ahead towards their partner and then hand off the baton and waits until it gets back around to them. When the kids race against each other they seem to work harder and have more fun. Also timing them makes them try harder; ompare their times from one session to the next. We also mix up the teams so they all get to know each other. 4. In terms of stretching and warm-ups we think that it is important to get a little jog in before starting to stretching. To do this we just take a warm-up lap around the field. While stretching we involve the kids with counting. When we do each exercise we stretch with them so that they can see how to do the stretch properly. It is important that they do it for a long enough time. We count aloud and get the kids to do the same thing. We have them yell the count as loud as they can because they seem to really enjoy that!" Brittany Davis, a CSUMB student helping with the Junipero Serra program and Shannon Dunne-Gamble, the JUST RUN leader developed a relay program that the children enjoyed and "asked for more". Its based on the Coach Sevene drill package and keeps things fun while emphasizing agility, balance, and several movements. Break the children up evenly into teams depending on how many cones you are using. The children on a team should be same as the number of cones used. Have multiple teams. Then place one child from each team at each cone. From the first cone to the second cone they did high knees. From the second cone to the third, the child at the second cone was lying on their back and when tagged they get up and will run backwards to cone three. From cone three to cone four, the child at cone 3 will be kneeling on both legs and once they are tagged they get up and do "grapevine" (running sideways) to cone four. From cone four to cone five the child at cone four is sitting and once tagged they get up and skip to cone 5. From cone five to cone 6 the child at cone 5 will be on one knee and once tagged they will sprint to cone 6. From cone six back to cone one the child will sprint and tag the next person. A key thing to remember is once they tag a person they stay at that cone and wait to be tagged. To help out too we also had a parent at each station to help the children. For example, make sure the kids stay at the cone, make sure they are laying or sitting or whatever and to remind them what they are suppose to do i.e. run backwards, skip etc. One great program idea is the Run with the Principal day started by Pepper Butler at New Republic School in Salinas. Pepper has a few days per week as part of the JUST RUN program where students can "Run with the Principal". Pepper gets in her own run and many many kids tag along with her. This is usually done on the track or the athletic field. Its amazing how many kids are motivated to run, be healthy, and stay active, by seeing that their principal does the same thing. 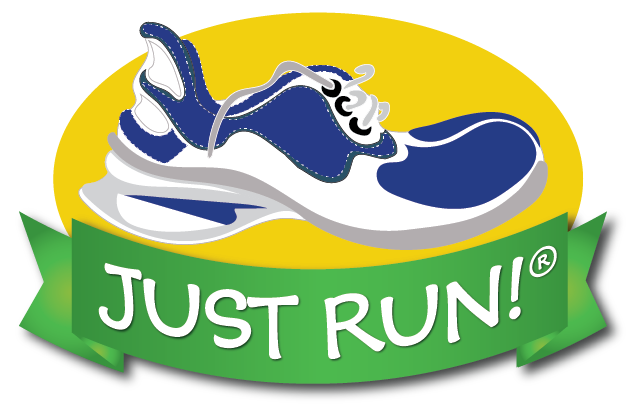 Kamann School in Salinas makes a point of starting the day with the JUST RUN program. There are many benefits for this. The children usually start the day by being social with their friends. Its a healthy way for the children to complete their social talk on a nice run, rather than waiting and using valuable classroom time. The teachers have also found that the early run "slows down" those children that are hyperactive and exciteable and makes them ready to concentrate when the enter the classroom. The early morning run makes the children more energetic and capable of concentrating on school as well in their early classes. Just like adults, Kamann students, comment that they miss their morning run when for some reason they cannot do it. Stephanie Fournier, the JUST RUN coordinator at La Mesa School, created a JUST RUN bulletin board in a prominent location in the hallway of her school. She used JUST RUN mileage markers and printed them off in color for 25, 50, 75, and 100 miles. These were posted on the bulletin board along with lists of children that achieved those mileage goals. This is a great motivator and gives recognition to all the children that reach mileage goals.